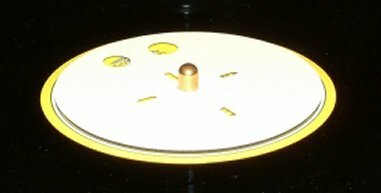 This unique but simple device absorbs any vibrations which remain in the record while it is being played. It rests on top of the LP during play, occupying an area smaller than the record label. Very light in weight, it comprises a single ring underneath an absorbent, low resonance disc. Ringcap is now in a MkII version using the new acrylic adhesives adopted for the Anniversary Ringmat.